The picture shows the architectural stonework which acts as a backdrop to the picture. Claude Buckle demonstrates in his water colour painting how to represent the stonework of the walls of this medieval town in the Dordogne France. 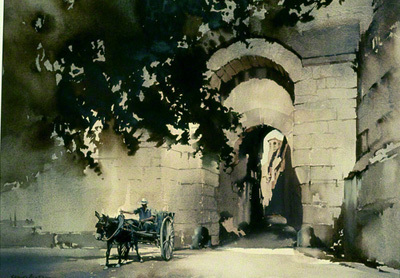 The pictures main subject is a donkey and cart shown in the foreground. Created in 1970.